88 Days until November 6th, 2018 (midterm elections) – Hello, I am Shelton. We have 88 days until November 6, 2018. November 6, 2018 is the day that U.S. citizens vote in the midterm election. If you have not registered to vote, please register to vote. If you don’t know where you will be voting from, find out where to vote. If you believe that you will not make it to the polls, please request an absentee ballot. Take the day off on November 6th, 2018. Check out, Rock the Vote, the internets best way to figure out what to do near you as of right now. Volunteer, donate, do something. For those that got to #7, help me build out and amplify, VoteNov.com. It is hosted on GitHub and is waiting to be shared, waiting for your pull requests, and waiting for your regional input. Personally, I’ve taken the day off and I believe that many other might benefit from doing the same thing. In solidarity as American citizens, I am taking the day off not for vacation, but for future investment. An investment in morals, an investment in my kids, and an investment in all those that are less fortunate than I am. This is a chance to stand up and do something. Talk about November 6th, 2018 EVERYDAY from now until it happens. 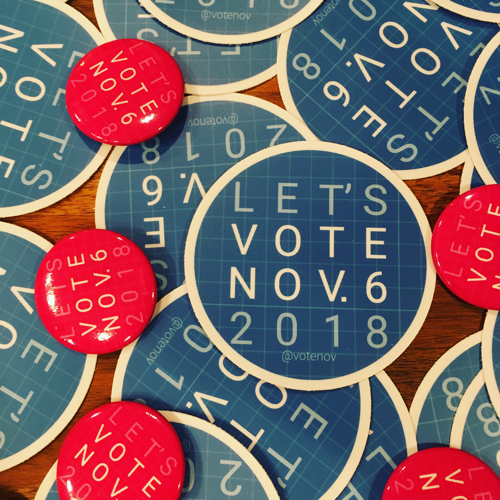 Continue to build out and support VoteNov.com as an outlet for people to share local voting knowledge. Spend time locally in Georgia to help more people register to vote and understand how to do so. Influence at least 10 local companies to shut their doors on November 6, 2018 as a gesture of voter support. 88 is probably my favorite number. Since I was little, the number was strong to me. 8 alone was great, but two 8’s together was marvelous! I loved the shape of stacked circles, the continuous look of the number 8, and wow was it fun to ride my big wheel in a figure 8. Fast forward to football in 1992, I wanted to be number 88 so badly, but I had to settle for number 86. Same happened in high school football. Through out might life, the number 88 has been lingering in the back of my head. Is it because it is stacked infinity symbols? I like the number 33 too, is it because 3’s are just unfinished 8s? I am 38 right now and have taken large risks in life to pursue what I believe to be a public and business need with Empathy Lab. 38 as an age combines some unfinished self and some finished self at the same time. Hmm…. 10 years ago today, I started rockpaperVote, an grassroots initiative driven by one, me, to plaster the city with Obama art work. First, I stole Shepard Fairey’s Obama poster work and made it my own by removing the “Hope” message and updating the message to read “Vote” in different languages. From German and Spanish to Swahili and French, I created wood boards (from pallets because I was broke) with Obama’s face and the word “vote” in different languages. Additionally, I took Mr. Fairey’s idea and pushed it a bit further and made larger more elaborated Obama posters. Commissioned work for Holly Crenshaw from the AJC. More work on Flickr.